I was perusing thekitchn.com yesterday to try to find recipe ideas. If you have never been there I definitely recommend it. I came across this post about caramelizing onions. I had some leftover raw diced onion just waiting to rot away in the fridge, so I decided to caramelize it and then freeze it so I could just throw it in a recipe at a later time. As I was caramelizing the onions this snack idea came to me. Its really simple and really addicting. 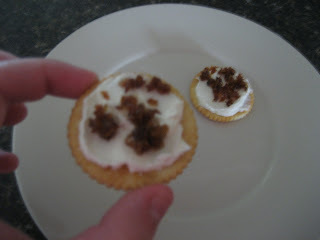 All you need to do it top a Ritz cracker with a little bit of cream cheese and then a little bit of your caramelized onions. It is seriously so good! I could not stop eating them! There are only two in picture because I had already eaten the other ten I made. Sorry the picture is blurry too, I could hardly wait to take the photo before eating them!